ProGrass Synthetic Turf Systems is a business based in Pittsburgh, Pennsylvania that provides top-quality artificial turf for schools and athletic programs to use. People- ProGrass is a privately-owned and fully self-contained business. Every person involved in the sales process, from the initial order to the final installation and post-installation upkeep, is an employee of ProGrass Synthetic Turf Systems. The ProGrass Turf website boasts that they have the industry's "longest history of private ownership in the United States" and that "Our people are the main ingredients that guarantee our customer satisfaction." ProGrass does not use subcontractors at any point of their sales and installation process, so customers know that they are dealing with people who are being held accountable for their work. Products- ProGrass submits their products for review by independent testing institutes and works with Act Global Sports to make sure that their artificial turf is the best in the business. These tests help ProGrass continuously update and improve their products, improving their durability, traction, and overall quality. They even have developed different types of turf for different sporting needs. Playability- The turf used by ProGrass has been tested against the very tough standard of the natural grass field at Kyle Field in Texas' A&M Stadium, which is regarded as being one of the best natural grass stadiums in the world. The testing matched ProGrass' turf against the natural grass under the FIFA Quality Concept for: shock absorption, deformation, rotational resistance, slip resistance, friction/skin abrasion potential, as well as ball bounce and roll. This helps to make certain that the turf ProGrass installs is the best turf available for the job. Professional Service- ProGrass prides itself on the quality of their service, from the initial design of your new turf to its manufacture and installation. At every step of the process, they strive for an absolute, 100 percent customer satisfaction rate. Proactive Maintenance- To make sure that their customers are completely satisfied with their products both now and in the future, ProGrass uses regularly scheduled maintenance to keep their products looking and playing like new. Over time, even the best synthetic grass will eventually wear out, grow mold, and become unsuitable for play if it is not properly maintained. ProGrass' "Rhino" maintenance program is designed to ensure that the turf continues to be bright and attractive while remaining a viable play surface for the life of the product. ProGrass' turf has made the news several times over the years, and for the right reasons. One Yahoo! Sports article might call the Consol Energy Park's field "bizarre" for being dirt-less, but the ProGrass Synthetic Turf installed there has earned an overall positive response from baseball teams who play there. Trinity coach Levi Bristor was quoted as "raving about a surface which has been described as 'stunningly green,' and able to host a game just minutes after a heavy downpour." One of the more impressive features of the stadium is that even the dirt paths and white baseball diamond on the field are constructed of colored synthetic turf. This gives the audience the appearance of the traditional baseball field even as it gives players an entirely new play experience that takes the dirt stains out of that desperate home-base slide. ProGrass is proud to offer their services to the entirety of the U.S., having serviced hundreds of fields across the North American continent. From sports parks in the southernmost tip of the Florida peninsula to the Barrow High School athletic field in the northernmost reaches of Alaska, ProGrass has provided top-quality synthetic turf service to numerous schools, stadiums, and sports centers throughout America. To celebrate their success as a company, Pat Oakes from ProGrass decided to commission an ebony and silver plaque of their Triway High School article from The Daily Record, a newspaper from Wooster, Ohio. 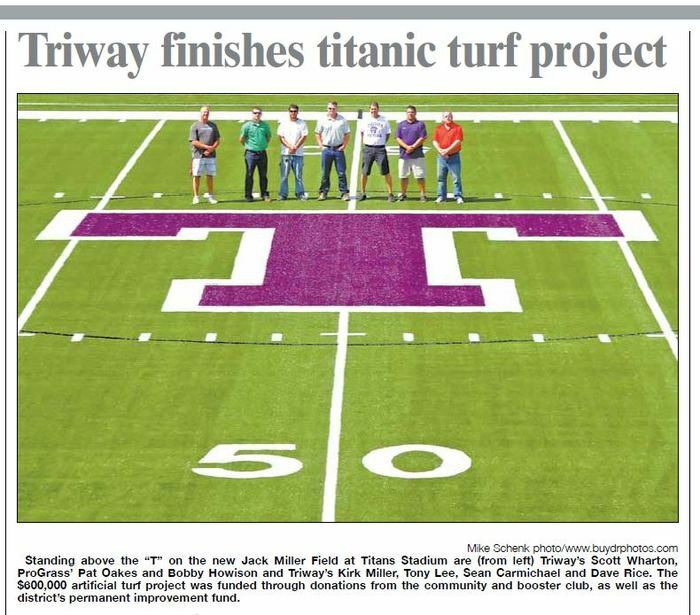 The newly-installed turf of the Triway football field is a vibrant viridian and purple that pops out to the eye, even in a newspaper article. Now, the image and the article of the perfectly crafted football field will be preserved for posterity's sake in an equally gorgeous decorative keepsake. The article is sealed within the plaque itself, which renders the pictures and articles inside immune to the ravages of time so that they don't become yellow, cracked, or torn. This keeps the article looking attractive and like new so that visitors to the ProGrass office can see their story and not be repulsed by unsightly paper decay. By immortalizing their article in a beautiful ebony plaque, ProGrass has created a trophy piece that will be a proud reminder of their commitment to providing quality service to all of their customers. We here at In The News are happy to have helped this company preserve its proud history of excellent service. It is our hope that ProGrass continues to enjoy success as a key provider of synthetic turf solutions and that their work continues to make headlines. If you would like to celebrate your own company's achievements with a celebratory plaque that can inspire your own employees, try out our custom plaque creation process today, or contact us at 1-800-548-3993.